Gardner Minshew was headed to Alabama for his final year of eligibility when a phone call from Mike Leach changed his plans. Now, he's WSU's starting quarterback. It was only one sentence, but it was enough to help convince Gardner Minshew to change course and back out of his commitment to Alabama and come to Washington State. “How would you like to be the leading passer in the country?” Washington State coach Mike Leach asked Minshew over the phone. “That’s what I tell all of them,” Leach said of his recruiting pitch to quarterbacks. It appears Minshew, a graduate transfer from East Carolina, has won the starting quarterback job at WSU after a competitive three-way battle during training camp with Trey Tinsley and Anthony Gordon, and will presumably start when the Cougars open the football season on Saturday at Wyoming. That certainly wasn’t in his plans when Minshew, 6 feet 2 and 220 pounds, decided to leave East Carolina after throwing for 2,140 yards and 16 touchdowns last season. Because he had already earned his bachelor’s degree in communications, he could transfer anywhere without having to sit out a season. Shortly after, he committed to Alabama, which it appeared might be in need of a backup quarterback this season. He was promised a job as a graduate assistant the following year with the Crimson Tide, and Minshew, who wants to be a coach, saw great value in getting to be part of Alabama’s staff. “It would be like going to the Harvard school of coaching,” Minshew said. And he likely would be in Tuscaloosa now had Washington State not been looking for a quarterback after Tyler Hilinski, who likely would have been the starter, died by suicide in January. Leach got a tip from former mentor Hal Mumme about Minshew. So Leach made the call to Minshew, asking him if he wanted to lead the country in passing. Minshew, who did not want to talk about his reasons for leaving East Carolina, was the only quarterback in WSU camp with experience playing games at the position for a four-year college. He played in 17 games over two seasons with East Carolina, starting in seven, and threw for 3,487 yards, with 24 touchdowns and 11 interceptions. But he certainly was not handed the job. Early in camp, reps in practice were split equally between Minshew, Tinsley and Gordon, but Minshew has gotten more the past couple of weeks. That all three performed well made it a tougher decision. While it was a very competitive battle among the three, it has not stopped them from becoming friends. “They are great guys, we all get along well and whatever happens on the field won’t affect us off the field,” Minshew said. 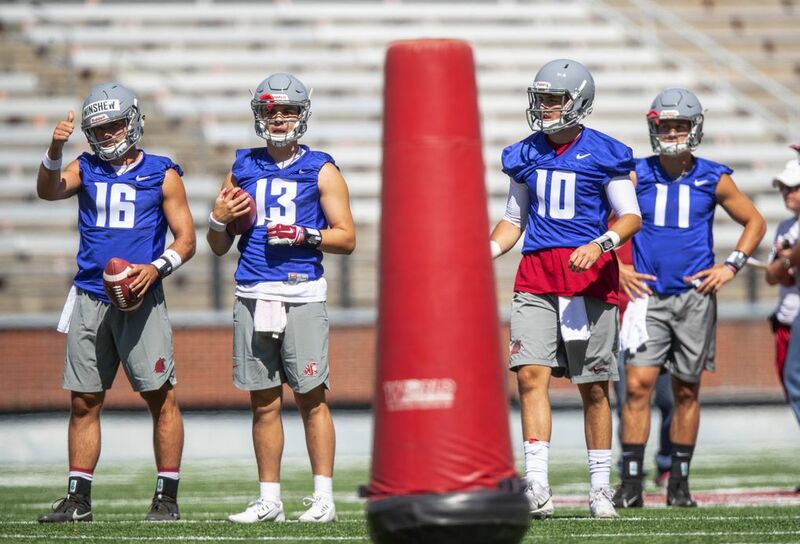 Minshew didn’t have the same familiarity with the WSU offense as Tinsley and Gordon, who both shined during spring drills. 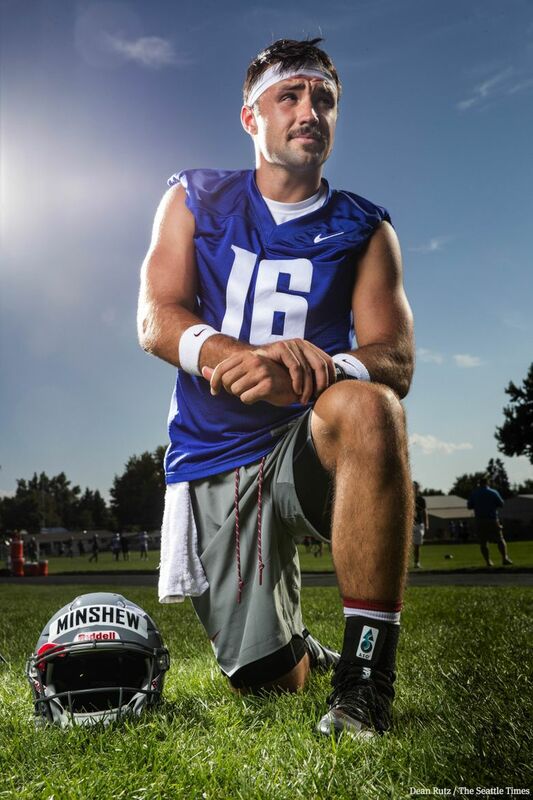 But Minshew, who was a 4.0 student in high school and got his bachelor’s degree in three years, was a quick study and picked up things quickly during practices the past few weeks. It helped that the offensive systems he played in are similar to WSU’s. The pressure will be on Minshew from the start as WSU plays a tough opening game at Wyoming. And while Leach said he tailors his offense to the talents of those running it, one thing never changes: There will be a lot of passes. That is something Minshew is used to. He threw for 11,222 yards and had 105 touchdowns during his four seasons at Brandon High School in Mississippi, becoming somewhat of a legend in the community, a suburb of Jackson. Despite the big numbers, Minshew wasn’t heavily recruited. He walked on at Troy State, but never played there and instead played a season at Northwest Mississippi Community College, leading the team to a national title by throwing for 3,288 yards and 28 touchdowns. That earned him a scholarship to East Carolina, where he was the on-again, off-again starter for two seasons. That he had to earn his role at WSU was nothing new for Minshew, who said he had to do it every year in college, including at Northwest Mississippi. On that front, it is mission accomplished. Leach said his choice as the starting quarterback would be the player who best elevated the players around him. That fits in with what Minshew said is his biggest strength. Minshew had followed Leach since his time at Texas Tech, but admitted he really didn’t know much about Washington State until he signed, and now the team’s fate rests partly on him. Winning the starting job, he said, was just part of the process. Now he wants more. Much more.